"The JD(U) should realise that its standing among the people of Bihar would be imperiled if it remains in the NDA," Congress leader Sadanand Singh said. Bihar Chief Minister Nitish Kumar has had reservations about the Triple Talaq bill for long. 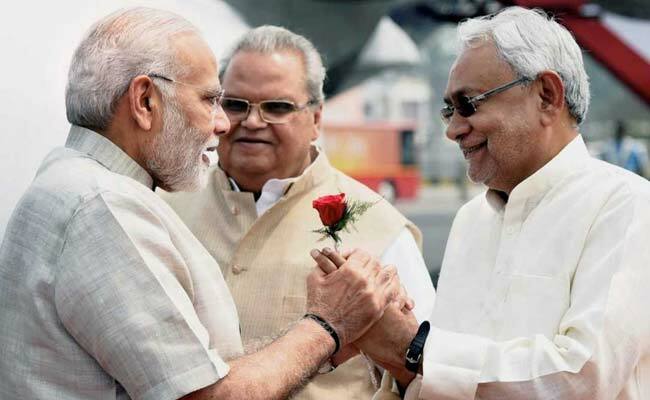 With the Janata Dal (United) being firm in its opposition to a bill against Triple Talaq, the Congress on Friday said it was high time that Chief Minister Nitish Kumar's party walked out of the BJP-led NDA or risk being wiped out from Bihar. Congress Legislature Party leader Sadanand Singh said the JD(U) had sharp ideological differences with the BJP on important issues like the Ram Temple and Triple Talaq. "The JD(U) should realise that its standing among the people of Bihar would be imperiled if it remains in the National Democratic Alliance (NDA). In such an eventuality, it will be wiped out from the state," he said. The JD(U) had made its stand on the Triple Talaq issue clear even when an ordinance on the same was promulgated by the Union cabinet. Leader of the JD(U) in Rajya Sabha and the party's general secretary Ram Chandra Prasad Singh had favoured arriving at a consensus with other parties on the issue. He had also warned that if a bill is brought on this issue in Parliament, the JD(U) will voice its opinion more vocally. In a bid to downplay the JD(U)'s stand, Bihar Deputy Chief Minister Sushil Kumar Modi said, "Allies have a different opinion on matters like Ram temple, Article 370 and Triple Talaq. But there is no difference of opinion within the NDA on the issue of development."